Join Japanese artist and educator Rui Sasaki as she unveils for the first time her 2018 Rakow Commission piece. The Rakow Commission is awarded annually to up-and-coming and established artists whose work is not yet represented in the Museum’s collection. Deprived of sunshine in one of the rainiest regions in Japan, Sasaki began to develop artworks—like her Rakow Commission piece—that capture the light. In her Behind The Glass lecture, Sasaki will discuss the development of her work, the evolution of her career, and her endeavor to capture the sun. Sasaki uses an array of materials in addition to glass, including resin, ice, light, and performance, to highlight subtle aspects of everyday life. Liquid Sunshine/I am a Pluviophile is a room-sized installation which distills Sasaki’s interest in weather. 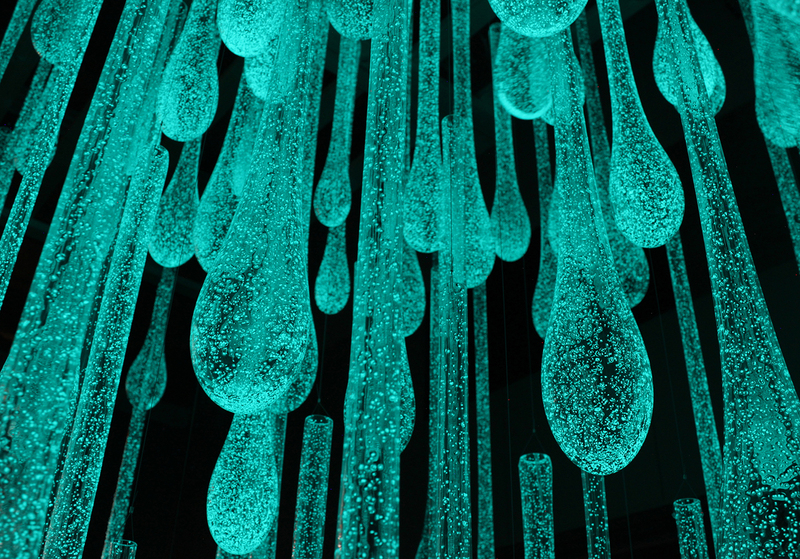 The commission consists of more than 200 blown glass “raindrops,” each embedded with small dots of phosphorescent material that absorb simulated sunlight. Sasaki’s installation is also one of 100 works included in New Glass Now, the Museum’s 2019 special exhibition, which opens in full this May. This very special Behind The Glass will be followed immediately by a dessert reception. All portions of this event are free and open to the public.